What makes or breaks a blockchain? Definitions overlap. Characteristics get mixed up. The confusion between them has fostered a cottage industry to scam newcomers. But, the original blockchain, aka the Bitcoin blockchain, is no scam. Far from perfect, it is, in fact, slow and expensive to run. Such is the cost of an autonomous blockchain without a corporation or government behind it. From the most autonomous to the least, let’s slide down the Blockchain Spectrum. Blockchains are decentralized, immutable and fully open to all. Characteristics: fully decentralized, neutral, transparent, immutable and permissionless. Pros: The only chain that expanded organically, the Bitcoin blockchain is likely to remain a unique monetary phenomenon. Cons: The autonomous expansion comes at a high cost in price, energy and speed. Characteristics: Popular and open to all, these emerging blockchains depart slightly from the original concept of a blockchain. Aside from recording transactions, they provide a base to build and quickly experiment with applications. Example: Although chronically struggling to scale, Ethereum is the go-to developer blockchain for apps and especially smart contracts. Many dApps have their activity faked by bots transacting between themselves. Pros: Many of these blockchain combine increasingly liquid markets with developer-friendly communities. Cons: With lower hash-power, these chains are more vulnerable to both hard forks and 51% hacks. Moreover, since their code requires constant upkeep, they need central planning to survive. Characteristics: Something in between public chains and a company-controlled coins, semi-blockchains are masters at milking the token model. Top coins on Coinmarketcap circa July 2014: half of them are dead, re-branded and knocked far down the list. Example: As of January, the NEM foundation has kindly asked the public for a rescue package for its blockchain. Pros: Free from decentralized consensus, they are faster and more efficient than public chains for managing transactions. Cons: Arguably, they pass off as public blockchains to elude the legal framework and dodge inquiries from regulators. But they’ll have to clarify their stance eventually. Hinging on tokens -thus on the company possessing the majority of them, these blockchains are centralized, but use blockchain-like properties to track and distribute their coins. Characteristics: Under the control of a corporation, centralized blockchains rely heavily on planning and marketing to function. Example: Ripple is the model for all centralized, corporate blockchains. Pros: Swifter than most, central blockchains are great at syncing with semi-corporate business models. Cons: Albeit more transparent than a typical bank, the state of the Ripple blockchain is still highly dependent on the Ripple Labs company: any XRP transaction can be reneged on at any time with little recourse for users. Moreover, besides raising funds for Ripple labs, the XRP token has very few other use case. 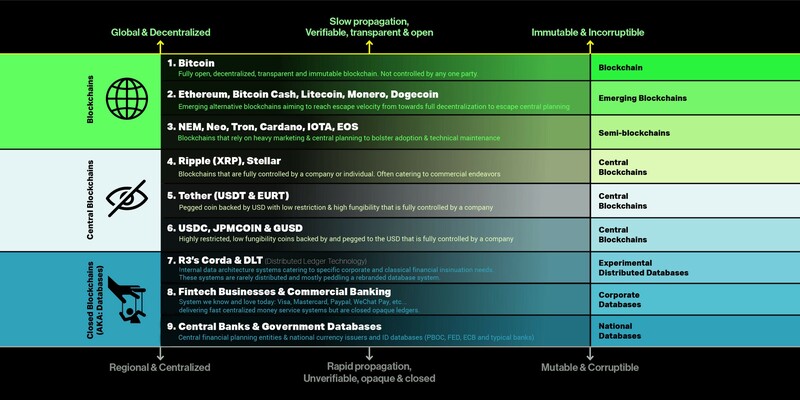 Characteristics: Stable tokens are pegged to the USD or other fiat currencies. Example: Although a work in progress, Tether is considered a highly successful stablecoin. Pros: Created to dull crypto’s volatility, pegged coins mitigate the default risk. Thanks to their reasonable fungibility and stability, much needed liquidity was injected into the crypto markets. Cons: Centralized, these stablecoins are sensitive to pressure on their company. Lacking a clear way to cash out, many exchanges listing USDT nickel-and-dime traders on spreads and fees. Characteristics: Controlled by a financial institution, those blockchains are vetted, approved, dollar-pegged cryptocurrencies. Example: Allegedly the world’s first regulated stablecoin, Gemini’s GUSD is the only NYDFS-supervised (New York Department of Financial Services), State Street-backed, dollar-pegged cryptocurrency today. The newest player on the block, J.P. Morgan have just announced the release of their own crypto stablecoin: JPM Coin. Rival to XRP, that coin is planned to be used for inter-bank settlements currently handled by SWIFT messages. Pros: More regulated, stablecoins tend to be accepted by other regulated corporations. Albeit recent, these companies are paving the way toward an attractive, fiat-backed stablecoin market. Cons: Accepted on a select few networks & exchanges, these highly regulated tokens are difficult to trade and even harder to cash out. At and below this level, systems are built using the typical Oracle or PostgreSQL data structure. Closed-off from external use, it is questionable why these databases are called “blockchains”. Characteristics: Often used for internal corporate purposes, these experimental, distributed databases dabble in cryptography and notions gleaned from public blockchains. Another chief leaves: CEO Blythe Masters has stepped down in December, marking another CTO departure from Digital Assets. Example: Leaders of the “blockchain, not Bicoin” trend, Digital Assets and R3 Corda now prefer the word “DLT” (“Distributed Ledger Technology”) over “blockchain”. Aiming to modernize legacy processes, they tailor ledger solutions to systems overdue for an upgrade. Advantage: Distributed ledgers are configured to facilitate self-auditing, compliance requirements and model reconciliation. Disadvantage: With very few use cases outside of their own corporation, these untried, experimental databases often encounter issues. Characteristics: Fintech companies today are tapping into blockchain tech in so far as they are using a distributed database among themselves. Examples: The most famous examples, Visa, MasterCard and PayPal had to build their networks on top of banks’. Pros: Thanks to extremely fast and consistent service, these companies offer a sense of familiarity. Cons: Often region-locked, fintech startups exhibit the same limitations in practices and curbed expansion than the banking network they are built upon. Characteristics: Databases similar to the 8th level, albeit on a nation-wide scale. Example: Central banks and government have databases. Pros: Centralized services can offer stability in times of economic turmoil. Cons: In charge of implementing its economic policy, central banks are completely aligned with their government. Best case scenario, central banks become too-big-to-fail entities. Worse case scenario, they follow doubtful directions. There you have it, folks! Slews of blockchain have tried — and failed — to emulate Bitcoin’s beginnings. Over and over, alternative blockchains turn into money pits, sunk costs racking up to keep the chain alive. Private chains, just like the private intranets of the early 2000s, are likely to fade out in favor of global, public counterparts. While small transactions will likely be carried out via banking networks for the foreseeable future, maybe a few chains — Ethereum? — could reach escape velocity from central planning. A true blockchain is an autonomous one. Once born, it requires minimum human input to keep the blocks flowing. Our 9 Shades of Blockchains show that while a ton of tech falls under the designation today, there is only one true blockchain. However advanced, other blockchains are merely attempts to replicate the singularity of the original blockchain. Try after try, it is dawning that recreating the Bitcoin blockchain is like trying to recreate the big bang. It only happens once. For more crypto industry and bitHolla news, check us out on Facebook, Twitter, LinkedIn and our website!